John Alvin McKay was born on Lot 5 Concession 13, East Nissouri Township to Margaret (nee McKellar) and William Munroe McKay. He grew up in East Nissouri Town­ship. 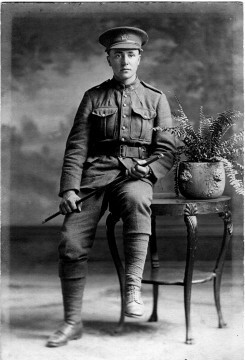 Alvin was drafted to the 1st Battalion and after serving in the trenches in France, he returned in the spring of 1919. He married Annie McLeod, daughter of Mr. and Mrs. Robert McLeod. His parents bought a farm for him on Lot 5, Concession 4, West Zorra Township. He served as Regional Advisor for the Veterans' Land Act starting in 1943. Both Alvin and Annie are buried in North Embro Cemetery, West Zorra Township.